After this morning’s leak, BMW has officially taken the wraps off the 3-Series LCI. After this morning’s leak , BMW has officially taken the wraps off the 3-Series LCI. The exterior tweaks are subtle at best, but the Bavarian marque says they have updated the front aprons with new air intakes along with revised headlights that are optionally available with full LEDs. The rear end hosts a revised apron with a specific trim element depending on the Line version while the taillights come as standard with LED technology. BMW is providing a wide array of exterior paint schemes along with fresh alloy wheel designs. Stepping inside the cabin, there are new materials, extra chrome accents for the air vents and central control panel, along with a new sliding cover for the cup holders. There's also a new full color head-up display and a revised Navigation Professional system faster than before and with more realistic 3D graphics and free map updates for three years. BMW says the 3-Series facelift is the first model in its segment to benefit from LTE and they are also introducing a revised Parking Assistant granting automatic parallel parking. There iss also an Auto PDC system which will automatically turn on the front parking sensors whenever necessary. There are four gasoline and seven diesel Euro 6 compliant engines to choose from, with output ranging from 136 PS (100 kW) to 326 PS (240 kW) for gasoline units and from 116 PS (85 kW) to 313 PS (230 kW) for the diesels. The 320i now has a new 2.0-liter 4-cylinder with 184 PS (134 kW) and 290 Nm (214 lb-ft) of torque. 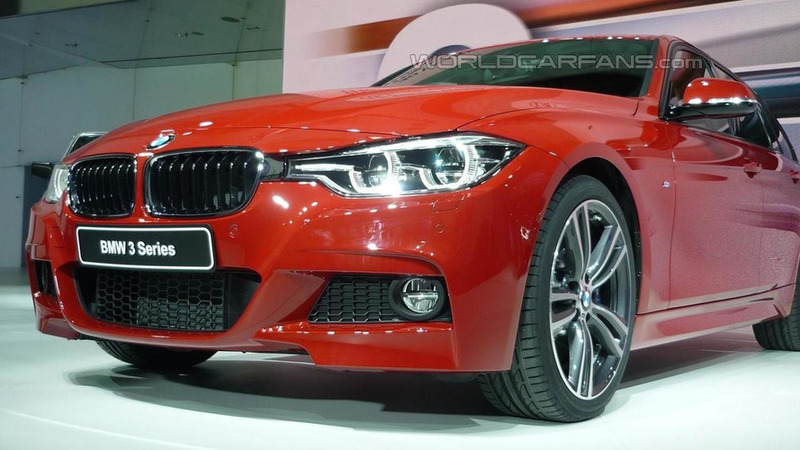 In the beefier 330i (replacing 328i), it churns 252 PS (185 kW) and 350 Nm (258 lb-ft). An important engine change is the addition of an all-new 6-cylinder 3.0-liter all-aluminum motor powering the 340i (replaces 335i) where it develops 326 PS (240 kW) and 450 Nm (332 lb-ft). It works with an 8-speed Steptronic gearbox and sprints to 62 mph (100 km/h) in 5.1 seconds before topping out at an electronically-limited 155 mph (250 km/h). Another modification in the engine department is a 6 PS power bump for the 320d to 190 PS (140 kW). BMW is adding a 330e plug-in hybrid model with a 252 PS (185 kW) and 420 Nm (310 lb-ft) combined output, enough for a 0-62 mph (0-100 km/h) run in 6.3 seconds and a 140 mph (225 km/h) top speed. It consumes just 2.1 liters / 100 km (134.5 mpg UK or 112 mpg US) and has 49 g/km of CO2 emissions and can be driven in electric mode for up to 22 miles (35 km). The entry-level 318i is now equipped with a three-cylinder turbocharged 1.5-liter gasoline engine developing 136 PS (100 kW) and 220 Nm (162 lb-ft). It will do the sprint in 8.9 seconds and hit a maximum speed of 130 mph (210 km/h). BMW says xDrive will be optionally available for the 320i, 330i, 340i, 318d, 320d and 330d models while gearbox choices include a six-speed manual and the aforementioned Steptronic box. 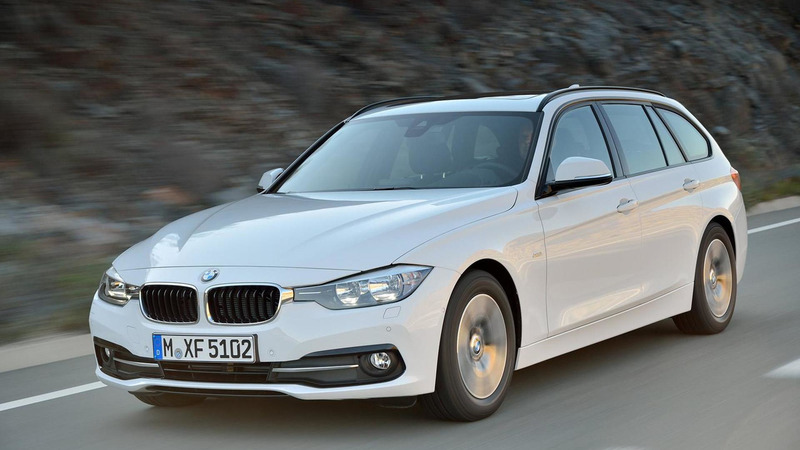 The facelifted BMW 3-Series will go on sale in the second half of the year.